General Derge-sé and his 500 troops of the Ta-dang regiment at Markham on the eve of the Chinese invasion. Note national flags at left. Photo: Karen Boatman collection. On this auspicious occasion of Tibet’s Independence Day I offer my readers an essay on the Tibetan flag and anthem I wrote some years before I had this blog-site. It appeared in Phayul on May 20, 2004. Subsequently I received more information on the subject from friends and readers. I will post them in the second part of this essay in a couple of days. Since the uncompromising denial of Tibetan independence (even as a matter of bygone history) has always been one of these “fundamental principles” it should come as no surprise that much academic and even general writing on Tibet should evince a mealy-mouthed quality that sometimes degenerates into out-and-out intellectual dishonesty. Even in something as presumably apolitical as Buddhist studies, certain scholars have been known to insist that Tibetans don’t have a national identity, and the only thing that could be said to define Tibetan identity was Buddhism. Aside from the superficiality of their grasp of Tibetan history, the detractors of Tibetan “nationalism” are evidently unaware of more recent and enlightened developments in nationalism studies. Such traditional and condescending Eurocentric views of Asian and African national identities as merely following “models” already formulated in Europe or America and imposed on, or adopted by, such colonized lands, are now, of course, regarded as exclusionary and incomplete. These outdated notions of Asian nationalism as being “imagined, or invented” have been pretty well dismissed by experts on the subject as Partha Chatterjee (The Nation and Its Fragments) and Prasenjit Duara ( Rescuing History from the Nation: Questioning Narratives of Modern China) who offer us more complex and nuanced views of Asian nationalism where indigenous historical, cultural and even religious factors are no less relevant to its evolution than merely the influence or machinations of European or American colonial and imperial powers. But let me stop here. I do not intend to go into a detailed discussion on Tibetan nationalism per se, at this time. I raised the issue largely to set the stage, as it were, for this defense of the two principal symbols of Tibetan nationalism – the flag and the anthem. The truth of Tibet’s independence has been so misrepresented and criminalized by the PRC, so shamefully abandoned by Dharamshala, and worst of all, so nervously avoided (at all costs) by a large and craven segment of exile society and “supporters”, that it should come as no surprise that its two faithful symbols should have to put up with growing misrepresentation, even ridicule, as mentioned at the start of this article. Most probably the Tibet supporter (?) in question had picked up the bit about the Tibetan flag being “copied from the Japanese” out of Patrick French’s last book, Tibet Tibet, where the author suggests that both symbols were somehow concocted “… deliberately in exile, a regimental banner devised in the 1920’s by a wandering Japanese man became the Tibetan national flag, and a song written by the Dalai Lama’s tutor Trijang Rimpoche was adopted as Tibet’s national anthem.” French is flat out wrong in his assertion about the flag and only just partially right about the anthem. First let’s take up the issue of the flag. To begin with, what French and others casting doubts about the origins and authenticity of the Tibetan flag fail to appreciate is that the entire business of countries having specific “national” flags is in itself a fairly recent development. An overwhelming majority of the countries in the world have only had a national flag since the 1940s or thereafter. Furthermore, few national flags have any meaningful contiguity, historical or cultural, with their nations’ historical past. Take the tricolors of Egypt (1984), Iraq (1991), Yemen (1990), and Syria (1980). 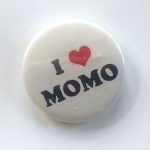 What connection do they have by way of symbol or color to Pharaonic Egypt or the Mesopotamia of Hamurabi, and so on? Or for that matter what link of tradition or symbolism does the present day flag of Communist China (1949), or even of Nationalist China (1928), have with ancient China? Absolutely nothing, as far as one can make out. All these flags, especially the Nationalist Chinese one with its sun emblem, might as well have been designed by a wandering Japanese. And let us take a look at the national flag of French’s own country. The Union Jack was originally a royal flag, rather than a national flag. In fact, no law has ever been passed making it a national flag, but it has become one through usage. Its first parliamentary recognition as a national flag came in 1908, when it was declared that “the Union Jack should be regarded as the National flag”. A more categorical statement was made by the Home Secretary in 1933, when he stated that “the Union Flag is the National Flag”. Even the various elements of the British flag were introduced in stages. The red on white English Cross of St George with the white on blue Scottish Cross of St Andrew, came about in 1606 after England and Scotland were united under King James. The diagonal red on white Cross of St Patrick appeared when Ireland was joined to the United Kingdom in 1800. This work also mentions, as does Professor Lux-Wurm, that the Thirteenth Dalai himself designed the modern flag. Most other accounts repeat the same, and further state that it occurred sometime before 1920, which, if accurate, makes the Tibetan flag far older than nearly all the national flags discussed earlier, even the two Chinese ones. The Dalai Lama retained the snow lion motif but added a white mountain below six red rays of a rising sun. The last feature is probably the grounds for the charge that “a wandering Japanese man” designed the flag. In His written description of the colors and symbolisms of the flag, His Holiness mentions that the six rays of the rising sun represented the miu dongdrug, or the six ancestral tribes of Tibet. Obviously the Dalai Lama was attempting to symbolize the primordial origins of Tibetan nationhood, and not revealing a weakness for the trappings of Japanese militarism. For anyone with even an elementary appreciation of Tibetan Buddhist art, the aesthetic provenance of the national flag should be fairly obvious. The abundance of bright primary colors (especially golds and reds), the profusion of symbols, the general “busyness” of the design, all somehow (quite inexplicably) coming together in a single harmonious whole, is appreciably in keeping with the principles and genius of Tibetan Buddhist art. The Tibetan flag lacks the wabi, the requisite “reverence for simplicity” of Japanese aesthetics, exemplified in the single red circle on a field of white, which is the Japanese national flag, the Hinomaru. If Yasujiro Yajima, to give our “wandering Japanese man” his proper name, did design the Tibetan flag he certainly created something very un-Japanese. And I think that most unlikely. The one thing we know Yajima definitely designed in Tibet are the barracks of the Guards regiment at the Norbulingka. The design is traditional Japanese, adapted to Tibetan building materials, but retaining the simplicity and bucolic functionality of Japanese architecture. And the idea of a Dalai Lama taking it upon himself to design the national flag is not an incongruous one, if we make an effort to understand the personality of the Great Thirteenth. He was fond of military display and attended not just the drills and parades of his soldiers but the polo matches of his officers, even personally awarding them special medals (possibly designed by himself) for their skill in horsemanship and musketry. 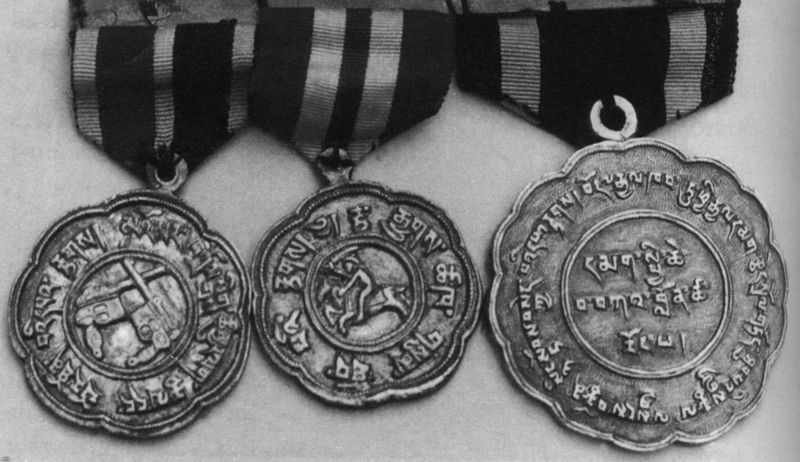 Medals for pistol-shooting, polo etc, designed by the 13th Dalai Lama and awarded to Tsarong Dasang Dadul. The obverse of all three medals has a single snow lion design. Photo: Tsarong collection. He was a hands-on sort of ruler and involved himself in the minutiae of administration, perhaps to a fault, as his friends and biographer Sir Charles Bell mentions. 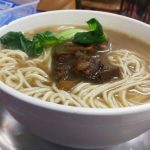 An old servitor of His Holiness told me that on learning of the “Eighteen-course Chinese Feast“ (gya-zay liu chugay) menu of official government banquets, a scandalized Dalai Lama personally worked out a less expensive bill of fare for official luncheons and dinners, the prosaic “Six Cups, Four Plates” (ka-drug de-shig) which became the standard for all but the most important official functions. The only existing copy of the original design (in exile) is now in the possession of the Tethong family. It was sent from Lhasa to Derge to the headquarters of the Governor of Derge (Dege-chikyap) of Eastern Tibet, Tethong Gyurme Gyatso, sometime in 1919 or 1920. According to his daughter (my mother) Lobsang Deki, the original design was the size of a small hand flag (about 7×10 ins) and painted on white cotton cloth. The bottom half of the cloth had a written description of the various symbols, colors and design elements. My mother recalled her father telling her that the description or praise (toepa) of the flag had been composed (ja-tsom) by His Holiness himself. She remembers the description being in the umay script, though she is not sure whether the calligraphy was that of His Holiness or of a secretary. It was from this source material that the design of the first national flag in exile was established in Mussoorie in 1959. It could perhaps be mentioned that the Tethong family also has in its possession one of the old battle flags flown by Tibetan regiments. 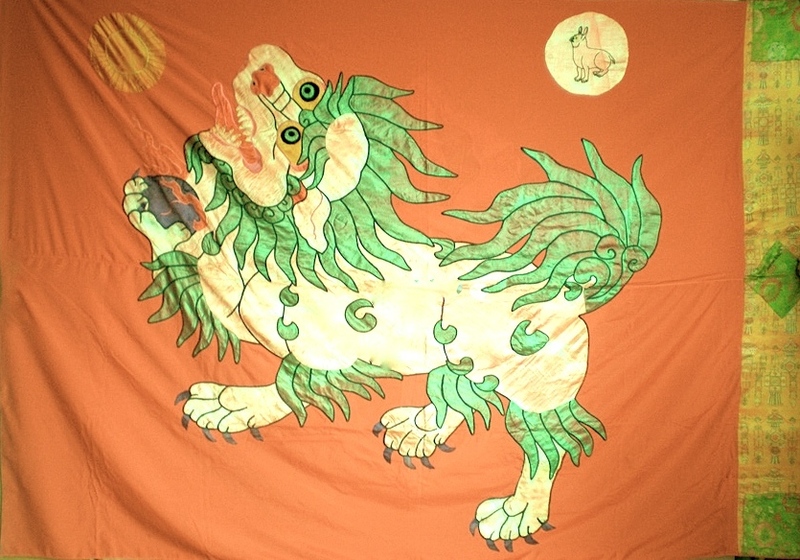 It is a large silk banner about five by seven feet, and depicts a single snow-lion rampant on a field of red. The new national flag was not only carried by all the regiments of the Tibetan army, but even displayed in public buildings as a national flag, long before Tibetans were forced into exile. In the two-part BBC documentary on Tibet (Tibet, The Lost Civilization and The Bamboo Curtain Falls) there is footage of the Potala from the roof of the Jokang. You can see the national flag fluttering from the top of the largest building at the foot of the Potala. But perhaps the most significant feature of the flag, typically overlooked by its detractors, is that the Tibetan public of the past clearly regarded it as their national symbol. Furthermore, the flag seems to have stirred the same sort of patriotic emotion in them as such symbols undoubtedly do elsewhere – in times of war or great national crisis. 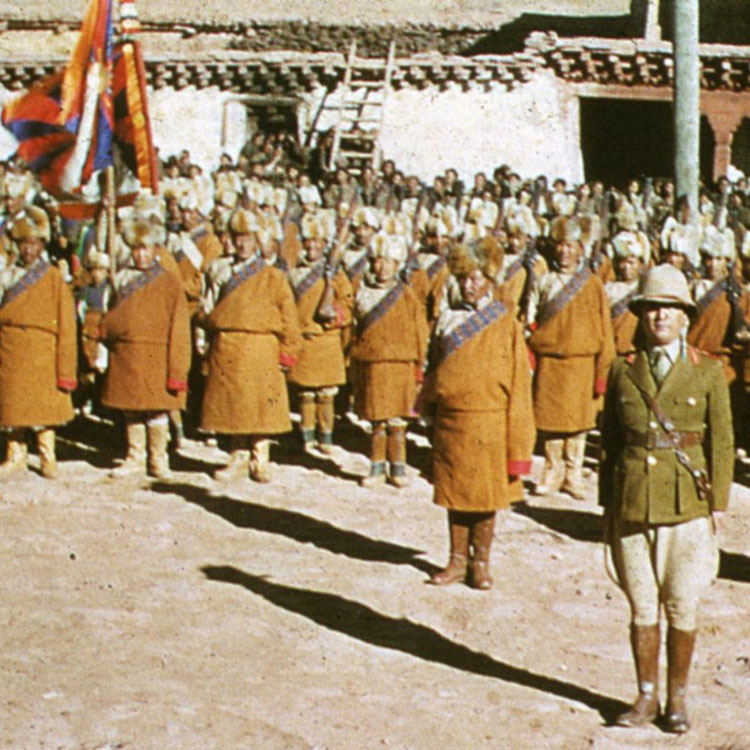 In 1951 the Chinese occupation authorities demanded that that Tibetan regiments only display the Chinese national flag. The Prime Ministers Lukhangwa and Lobsang Tashi refused, and the kashag tried to arrange a compromise where the regiments could carry both national flags. Rumors of this dispute spread among the Lhasa public, and as with such things became greatly dramatized in the telling. The final story, firmly believed to this day by the general Tibetan public, is that the Chinese demanded that the Red Flag be hoisted over the Potala but that Lukhangwa refused, declaring defiantly that as long as he lived only the Tibetan national flag would be flown over the Potala. Tsering Shakya, in his history of modern Tibet (The Dragon in the Land of Snows) tells us that both prime-ministers became “folk-heroes to the masses” over this incident. It should also be remembered that subsequently Tibetans braved imprisonment, torture and even execution for the flag. Just this year Radio Free Asia aired a report on a young monk, Choeden Rinzin of Ganden monastery, who was arrested for possessing a flag of Tibet. Last year in August 2003 activists in Lhasa raised the national flag from a high radio tower. Patrick French in Tibet Tibet, tells us that a Tibetan protester at the 1999 National Minority Games in Lhasa managed to pull down the Chinese flag from its pole and started to raise the Tibetan flag in its place before he was arrested. In Gadhe County in Golok, Lungtok and Choejor were arrested in January 1997 for putting up posters and for displaying the national flag. On February 21, 1997, at a public demonstration in Malho county in Qinghai province, the Tibetan National flag was raised and independence posters displayed in the main market place. In the very first pro-independence demonstration in Lhasa on September 27, 1987, many protesters carried small homemade national flags. The demonstration was put down with great brutality by Chinese state-security forces. 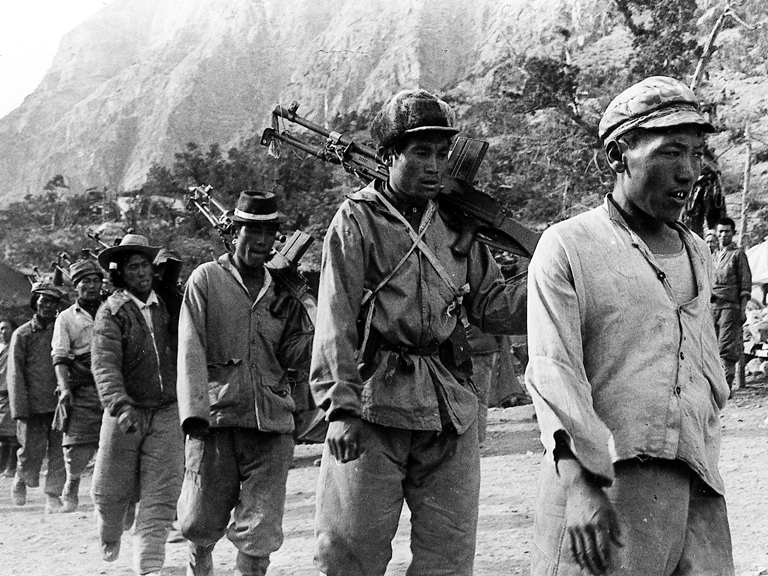 All those later arrested were accused of carrying the prohibited “snow mountain and lion” national flag of Tibet. In Michael Curtiz’s great war romance, Casablanca, there is a corny but moving scene that takes place in Rick’s Café Americain. A group of partying Nazi officers belts out the Deutschland Uber Alles which provokes the French and others in the Café to respond. Led by the Czech Resistance hero, Victor Laszlo (Paul Reid) they all defiantly sing the Marseillaise. Yvonne (Madeleine Le Beau), a pretty French coquette, drinking with the Germans, and flirting with the chief Gestapo officer Major Strasser (Conrad Veidt), has a turn of conscience and, with tears streaming down her cheeks, joins in the singing of the French national anthem. A leading Tibet expert in the United States, Professor Elliot Sperling of Indiana University, argues that visitors to present day Tibet, including Tibet experts, encountering a population nervously going about its daily business and not expressing open defiance of Chinese occupation, and then concluding that Tibetans are satisfied with the status quo, invariably fail to take into account the brutal realities of life under Communist Chinese rule. They further fail to take into account, what Professor Sperling has termed the “Yvonne factor” of dormant or suppressed Tibetan nationalism, which could be galvanized by a crisis or some unusual event, as it happened in 1979 with the first visit of the Dalai Lama’s representatives and in 1987 by the Dalai Lama’s speech to the U.S. Congress. Sometime in the foreseeable future, a lone voice singing the Tibetan national anthem at a Communist Party rally in Lhasa, might spark another revolution. The current Tibetan national anthem was written in exile, and the lyrics composed by the Dalai Lama’s junior tutor as Patrick French states – but that is not the whole story. First of all the lyrics of the anthem were written specifically for the national anthem and were not just some song written by him and adapted for the purpose, as French seems to suggest. Furthermore, the Dalai Lama’s junior tutor was requested to write the lyrics not because of his official or spiritual position but because he was considered to be the leading poet in the classical snyen-ngag style (based on the Sanskrit kaviya tradition). So, much in the way as poet laureates of new nations are sometimes commissioned to write the lyrics of the national anthem – as Rabindranath Tagore wrote the verses of the Jana Gana Mana – Trijang Rinpoche also composed the lines of our national anthem. 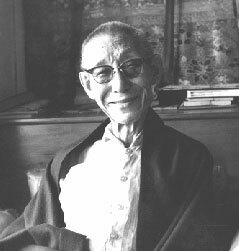 Many of the lyrics of the new songs composed in the sixties and sung at Tibetan schools and the Tibetan Institute of Performing Arts, were written by Trijang Rinpoche. The Dalai Lama’s senior tutor, Yonzin Ling Rinpoche, also wrote a number of songs at the time. The wish-fulfilling jewel of the Buddha’s teaching, blazes forth radiant light. By his actions stretches forth his influence like an ocean. His compassion and loving care extends to beings everywhere. And increase its fourfold influence and prosperity. Few Tibetans are aware that Tibet had an older national anthem dating back to the eighteenth century. I think Sir Charles Bell calls it Tibet’s “national hymn”, and remarked how in just a few lines it captured the essence of the Tibetan land and spirit. Kalsang Gyatso, bodhisattva of Compassion. The eminent Tibetan scholar, Tashi Tsering citing the historical work Bka’ blon rtogs brjod, says that this verse was composed by the lay Tibetan ruler, Phola-lha-nas, (in 1745/46) in praise of the 7th Dalai Lama, Kalsang Gyatso. I am, admittedly, hugely biased in this matter, and I cannot help but feel how the delicate simplicity and humanity of this verse probably has no equal in the genre, especially when one has to take into account the fact that most other national anthems usually express sentiments that are either boastful, chauvinistic, or outright militant. Take for instance this verse from the British national anthem, God Save the Queen. Arise, ye who refuse to be slaves! With our flesh and blood, let us build our new Great Wall! The Chinese nation faces its greatest danger. From each one the urgent call for action comes forth. March on! March on! March on! The only national anthem that, to my mind, shares the simplicity and poetry of the Tibetan national hymn is the Japanese Kimi Gayo. The words of the Japanese anthem are actually from a waka style poem from Japan’s Heian Period, about one thousand years ago. It was an Englishman, J. W. Fenton, who urged Japan to adopt this verse for a national anthem, and he wrote the original music for it in 1869. A German bandmaster, Franz Eckert, who established the military band of the Imperial Guards, later revised it into its present form. It was formally adopted as a national anthem in 1888. It should be noted that in old Tibet the “national hymn”, Ghang Ri Rawe, actually served pretty much the same purpose as a national anthem. It was recited at the end of most government functions (zego), or at the conclusion of all daily prayer services in monasteries and religious gatherings. In fact many individual Tibetans conclude their own personal daily devotions with this patriotic hymn that describes the essential features of the Tibetan landscape and wishes their sovereign a long life. The hymn is also a necessity at every opera performance (especially during the Shoton Opera Festival at the Norbulingka in Lhasa) and is sung during the introductory ceremony, like the Star Spangled Banner is sung before a Super Bowl game in the States. The Ghang Ri Rawe is one of the most beautiful arias in Tibetan opera. But of course it requires a trained voice to sing it in that style. Even in exile the hymn is recited daily at all schools, monasteries and institutions. So why didn’t Tibetans just retain this old hymn as a modern national anthem? Probably it was just a case of overlooking the obvious. In Japan it required an outsider to point out the eminent suitability of the old waka verse for a national anthem. If only Sir Charles Bell had persuaded the kashag as J.W. Fenton did the Meiji government. In the early years of exile in Dharamshala there was “new broom” spirit, when the Dalai Lama and the Tibetan government wanted everything new and modern, and so, of course, we had to have a new national anthem, as we had to have new Chinese style nationalistic songs and new historico-musical dramas and propaganda plays. The old lhamo opera went out of official favor for some years. 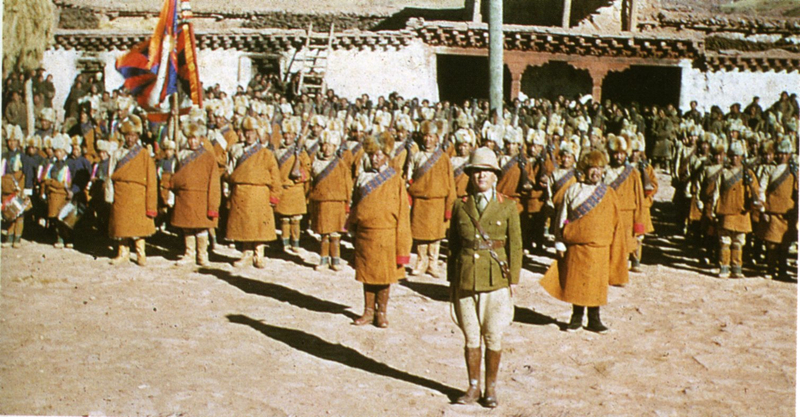 Resistance fighters parading at Kalsang Phug, Mustang. Photo: Jhanjup Jinpa. Link, Perry, “The Anaconda in the Chandelier”. The New York Review of Books, April 11, 2002. Pierre C. Lux-Wurm, “The Story of the Flag of Tibet”, Flag Bulletin, Vol.XII, No. 1, Spring 1973. Snellgrove, David & Richardson, Hugh. A Cultural History of Tibet, Prajna Press, Boulder Colorado, 1980. p. 32 . Dundul Namgyal Tsarong, In the Service of His Country; The Biography of Dasang Damdul Tsarong Commander General of Tibet, Snow Lion Publications, Ithaca, 2000. This reference was kindly sent to me by Douglas Wissing, author of Pioneer in Tibet: The Life and Perils of Dr. Albert Shelton. Vaclav Havel has eloquently spoken of the double personae that people living under coercive and repressive regimes adopt with regard to their intellectual, social and political behaviour. It is this forced adjustment to coercion that led observers so astray in predicting popular sentiment in a number of places (perhaps most notably the outcome of Nicaragua’s 1990 election). Put bluntly, a state that penalizes people for holding ‘wrong’ opinions is ill equipped to take an accurate reading of those opinions. In 1979 the Chinese authorities were stunned by the overwhelming emotional reception accorded the Dalai Lama’s emissaries when they arrived in Lhasa. The authorities appear to have actually believed, at some level, that only a ‘handful’ of Tibetans supported ‘separatism’, until the depth of the problem forced the authorities to take repressive measures well beyond a basic restoration of order. Tashi Tsering, “Reflections on Thang stong rgyal po as the founder of the a lce lha mo tradition of Tibetan performing arts,” The Singing Mask: Echoes of Tibetan Opera, Lungta Winter 2001 No 15, eds. Isabelle Henrion-Dourcy and Tashi Tsering. 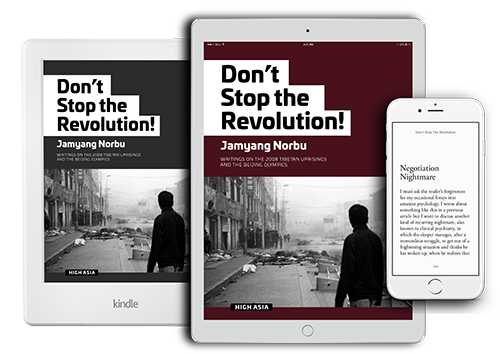 Thank you Jamyang Norbu la ;for writing this wonderful wonderful piece. There is so much to learn from you all the time and you have been equally generous about sharing your knowledge with us remembering that common folks could also contribute and make a difference if and when they are well informed . For that ; I thank you again.It truly felt like sitting in an interesting history class. Loved it. Losar Tashi Delex to you and your family. Thanks you, Jamyang-la, for reminding everyone that the Tibetan nation existed, and continues to exist, despite many people’s careless disinterest in the facts. Outward signs of sovereignty did appear in response to western expectations, but they were there in other forms before. What was the Potala but a massive show of the Tibetan national determination? Thank you for sharing your knowledge. My understanding of Tibet is always enhanced by your writing. Hello ! Thank you for this article. So, the flag shown belonged to Chadang regiment. – and then a new batch of square flags following the pattern of the national flag (white mountain and sun, blue, red or yellow sections and the letter of the regiment). Those flags were in used at least from 1943 to 1956. The Tibetan army as a whole apparently had its own flag. Freedom is bright right of every Tibetan. No individual who so ever has the right to curb it. Without political freedom, there won’t be religious, cultural or any other kind of freedom as we will be bound to live under “…….” for ever. Jamyang la, as always, thanks for the timely reminder lesson on the Tibetan National Anthem and the flag which, by the way, is being raised aloft the sky of the globe courtesy of the Students for a Tibet (Independence Tibet). 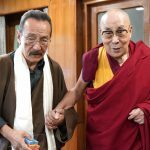 I heard Dorjee Tseten of SFT on Radio Free (thanks RFA) about the Tibetan Flag Challenge as the 102nd anniversary of the Re-declaration of the Tibetan Independence by the Great 13th Dalai Lama on February 13, 2015. I sincerely hope that the Tibetan Independence will be officially marked by CTA every February 13th until Tibet regains its independence from Communist China. An note of thanks for to the Tibetan Youth Congress chapter in Washington DC for organizing a lobby day in conjunction of the Tibetan Independence Day. Keep the Tibetan Flag Flying! Thank you kindly for this great informative article. A Treasure Trove of FACTS & information. one pointed………..attention – on Tibet and its sovreignity. Once again thank you for the worthy article and yes it’s so interesting and eye catchy(pictures) that I couldn’t stop reading as late as at this time1:55am (India). I salute your sleepless and tireless efforts in bringing out our history and struggle alive. Thank you for this awesome article and your tireless dedication to coming up with this treasure information. The beautiful waving flag will rise again over the land of snow one day…..till than the waving flag waves within our heart Forever. I would love that you write a History Of Tibet Nation in such a inspiring and lifting way JamyangLa. Personnal recall and anecdotic informations make your piece invaluable. Thanks for writing of Tibet Greatness and not trying like so many to lower or deny Tibet true story of Independant land in order to fit with present failed MiddleWay policy. Your “Horseman in the Snow” inspired me as a kid, and this piece (and others on your blog) inspire and inform me as an adult. Hey, this has had me laughing for a good while! More Tibetan ultranationalism, please! Can you send me the Free Tibet poem by Gawa Mangsa Pekar. Thank you Jamyang Norbu, your work is bountifully satisfying to read. This piece really gave me the feels and trying to get military experience as a young Tibetan in America makes me feel very connected with our old uncles and aunts who resisted Communist rule. Once again thank you.